Recently I won TWO giveaways! I do hope this sudden burst of luck sticks around! 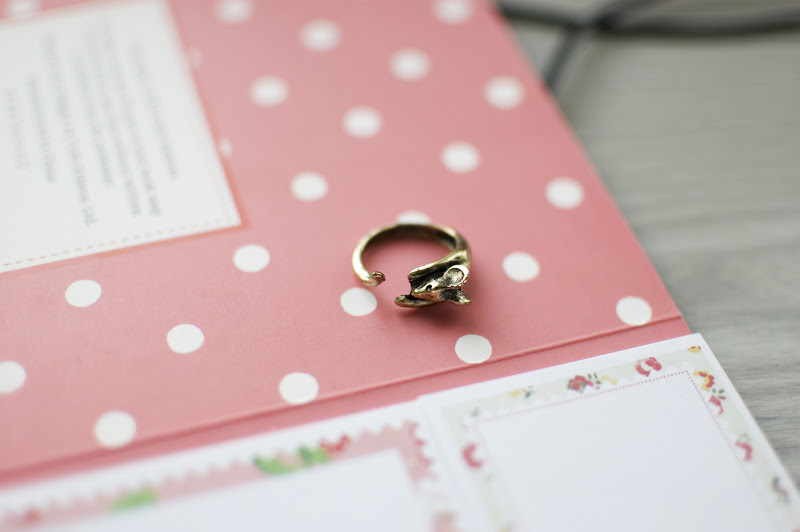 I would like to say thank you to firstly DIXI, a great online shop that sells both modern and vintage clothing, accessories and jewellery, who sent me this adorable little mouse ring in bronze - I have a huge love of pet rats and so when I wear it I just pretend it's a rat instead^^ You can find it for yourself HERE and don't forget that when shopping with Dixi you can use the exclusive discount code FASHIONYOUR10XO at the checkout for 10% discount! I also need to say thank you to Kimberley of SWEET MONDAY from whom I won a very cute polka dot playsuit courtesy of Very.co.uk, which you can find here. As you can see in the image above it has a cut out detail in the back, making it suitable for summer despite it being black! I've also brightened it up with yellow nails! I don't usually do yellow but I painted them like this the other day for a duck inspired test shoot! I bought these socks whilst in London for a show last Friday, I also got a lilac pair...I'm not sure when I'll wear lilac frilly socks...but I'll know when the time is right! I really wanted the sequin, beaded vest top, I'm sure you know the one I mean, but I couldn't afford it so instead I had to settle for socks to curb my shopping needs - for like, a day! Any way, I styled the playsuit with a broach as I like high neck clothing, and a skinny waist belt. Please excuse my knobbly knees, thank you. yay! congrats! definitely won some pretty cool stuff! 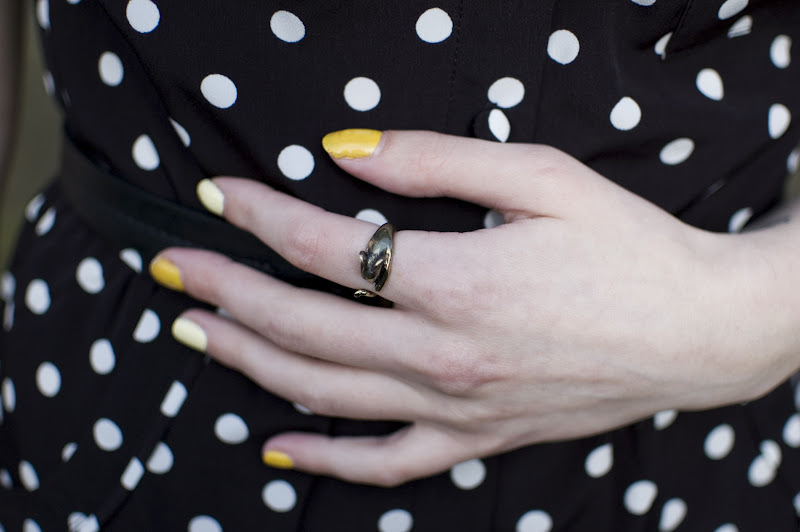 love that mouse ring and that the polka dot playsuit is perfect on you! Looks as if things are going well for you right now hahaha I'm entirely jealous of the outfit you put together and that playsuit is divine I think I might be in love. I love the ring and the socks!